I don't know about you, but I was both excited and frightened when I saw this box. I was happy because I saw sugar cookies, but then I was sad because the ice cream sandwich looks like some bizarre freaky fruitcake funk-a-dunk foo foo treaty treat.... I picked up the box and it said to me "I'm a sugar cookie flavored light ice cream with colorful christmas tree sprinkles between two vanilla flavored wafers". Hmmm, that sounds pretty good, and blue bunny definitely has a history of making some interesting ice cream sandwiches. Now I will admit that the box blue bunny seasonal selections HOT COCOA ice cream sandwiches right next to this box was also talking to me, but unfortunately I only had one blue bunny coupon with me. Ok, we're going with cookies this time, but I will be back! hehehehehe, I like the wrapping paper, it's a nice touch! Now like I was ranting before, I'm afraid that these little Christmas trees are a sign that these sandwiches might already be out of production, and that makes me sad because blue bunny's peppermint ice cream sandwiches just didn't do a whole lot for me. Enough talk, let's get to eating already. As always, I had my first one on the way home and it's not bad. 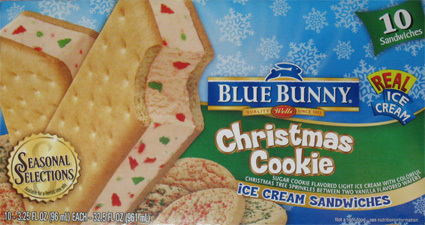 It kind of reminds me of Blue Bunny's birthday party ice cream sandwiches, but with a bit more a Christmas tang to them. The wafers are their usually consistency, and the Christmas tree sprinkles do add a little crunch here and there. I guess what I like is that they are different. If I need something with a little funk to it, but that is still fairly light (140cals, 5% fat (8% sat fat)), I'll definitely go for one of these over a skinny cow treat any day. i now wish that someone had brought some of these to christmas dinner. these are pretty good, still like the birthday party ones best. hope they come out with some new flavors for spring!